The warming of the past several decades has led to many changes in the water cycle including changes in precipitation patterns and intensity, greater frequency and extent of drought, widespread melting of snow and ice, increasing atmospheric water vapor, increasing evaporation, increasing water temperatures, reductions in lake and river ice, and changes in soil moisture and runoff. Impacts of these changes include too much water in some places and times, and too little in others. In general, precipitation is becoming less frequent but more intense. The resulting heavy downpours increase the risk of flooding and erosion. The longer periods of time between rain events, coupled with higher air temperatures, mean more drought conditions. 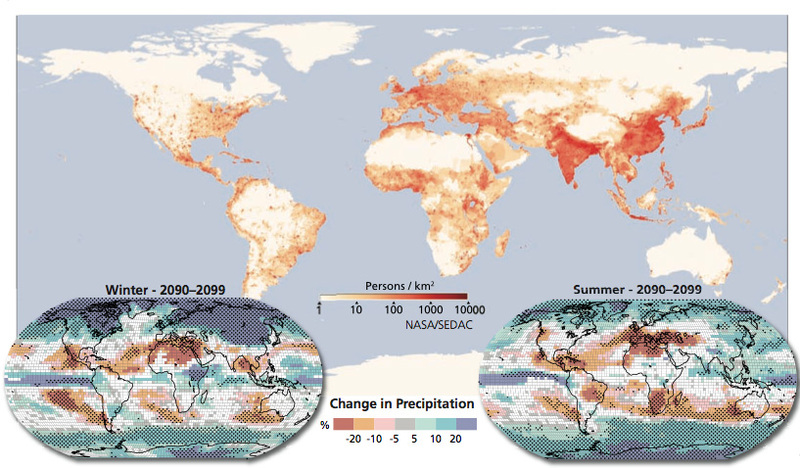 In addition, global warming is causing precipitation patterns to shift geographically. Generally, higher latitudes are projected to receive more precipitation. Increases in tropical precipitation are projected during rainy seasons, such as monsoons. The dry belt that lies just outside the tropics is expanding further towards the poles, and is expected to receive less rain. This means that regions including the North American Southwest and the Mediterranean are projected to become drier. Hundreds of millions of people face water shortages that will worsen as temperatures rise. Regions most at risk include those that are currently affected by drought, such as the African Sahel. By 2020, up to 250 million people in Africa could be exposed to increased water stress. More than one-sixth of the world’s people currently get their water from glaciers and snowpack. Water supplies from glaciers and snowpack will decline, reducing water availability in regions supplied by meltwater from major mountain ranges. Many glaciers in Latin America, for example, are expected to disappear entirely over the next couple of decades. In the U.S. West, three-quarters of the surface water comes from snowpack, which is already declining and projected to decline faster as warming proceeds. The land area affected by drought is expected to increase, and water resources in affected areas could decline by as much as 30 percent by 2050. In many densely populated parts of the world, water resources are projected to decline. These projections for spring precipitation in North America are for a scenario (A2) that assumes continued increases in heat trapping gas emissions. They show large increases of precipitation over the North, particularly the Northeast, and large decreases over the South, particularly the Southwest. Higher temperatures and reduced precipitation over the Southwest suggest increased drought risk.